Congenital heart disease (CHD) accounts for 10% of all congenital anomalies. In the developed world, it is one of the most common causes of death in the first year of life. Usually, CHD is diagnosed in utero or in the newborn nursery, however, some critical lesions do not manifest until 1 to 2 weeks of life, when the ductus arteriosus closes. Many of these conditions require immediate intervention. About 25% of children are born with critical and potentially fatal forms of congenital heart disease. It should be notedthat even those who have undergone surgical corrections may have residual deficits making them susceptible to acute illness. These are referred to as the terrible T’s or the horrible H’s. Cyanosis results from decreased pulmonary perfusion, or from complete mixing of systemic and pulmonary venous return in the heart. CHD is defined as structural heart disease present at birth. It is relatively common and affects around 1% of all newborns (actual incidence of 8 per 1000 live births). The outcome for an infant with CHD depends on the type and severity of the defect as well as the presence of extra-cardiac malformations which are common in this group of children. The more complex, cyanotic defects generally have a worse prognosis. Without surgical intervention, many of these are associated with death in infancy without surgical treatment. Those who have successfully undergone surgery usually remain well through childhood; but the prognosis in adult life depends on the type and severity of the condition, as well as the magnitude of any residual lesions. Consider alternate diagnoses: excluding non-cardiac causes such as sepsis, congenital adrenal hyperplasia etc. The first step in the evaluation is to determine whether the cyanosis is central or peripheral. Administer 100% oxygen for 10 minutes (hyperoxia), and then obtain a post-ductal blood sample for arterial blood gas analysis. In certain CHD, closure of the ductus arteriosus can precipitate rapid clinical deterioration. These are referred to as duct-dependent lesions. Clinical problems may also occur when certain structures remain patent beyond the immediate postnatal period, for example patent ductus arteriosus. Oxygenation of blood through the pulmonary system causes closure of umbilical vessels, the ductus arteriosus and the ductus venosus. CHD is broadly classified as acyanotic and cyanotic. Acyanotic:left-to-right shunts, in which oxygenated blood is redirected toward the right heart containing deoxygenated blood. Cyanotic: right-to-left shunts in which deoxygenated systemic venous blood is directed toward the left heart. Acyanotic lesions account for approximately 75% of CHD and acyanotic CHD is associated volume or pressure overload (Figure 1). Cyanotic lesions account for approximately 25% of CHD. Cyanotic lesions may be associated with decreased pulmonary blood flow (right-to-left shunts) or with increased pulmonary blood flow (intracardiac mixing). (Figure 2). There are many genetic and environmental factors that increase the risk of CHD and these should be considered about when obtaining the history. 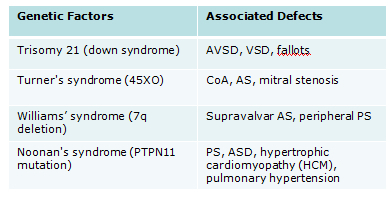 Specific gene defects have been identified in 40-60% of CHD (Table 1). 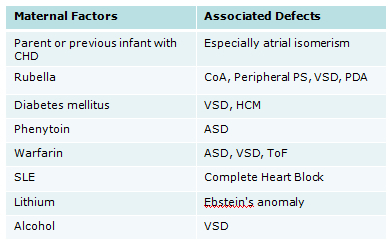 Maternal factors are also associated with certain forms of CHD (Table 2). Table 1 provides a summary of the more common types of CHD and their presentations. 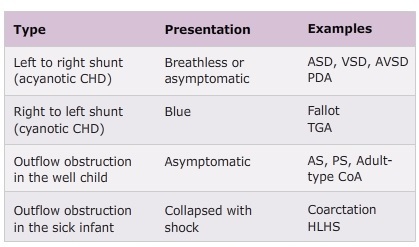 The following sections detail the various presentations of CHD in the ED and outline the defects, clinical features, investigations and management of the examples mentioned in Table 1. Both present with similar symptoms and signs, but their anatomy is quite different. 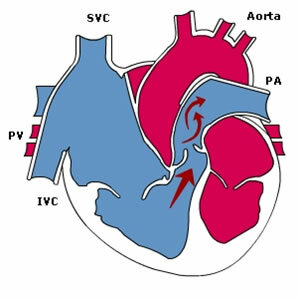 The secundum ASD is a defect in the centre of the atrial septum involving the foramen ovale (Fig 1). 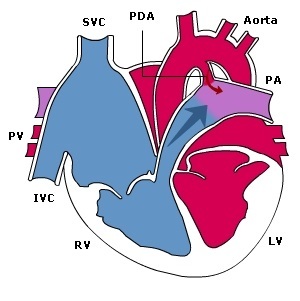 Partial AVSD is a defect of the atrioventricular septum. Children with significant ASD will require treatment. For secundum ASDs this is by cardiac catheterisation with insertion of an occlusion device but for partial AVSD surgical correction is required. Treatment is usually undertaken at about 3-5 years of age in order to prevent right heart failure and arrhythmias in later life. VSDs are common, accounting for 30% of all cases of congenital heart disease. There is a defect anywhere in the ventricular septum (Fig 2), perimembranous (adjacent to the tricuspid valve) or muscular (completely surrounded by muscle). They can be classified according to the size and location of the VSD. Small VSDs are smaller than the aortic valve in diameter, perhaps up to 3 mm. Large VSDs and complete AVSDs are the same size or bigger than the aortic valve. Demonstrates the precise anatomy of the defect. It is possible to assess its haemodynamic effects using Doppler echocardiography. There is no pulmonary hypertension. These lesions will close spontaneously. This is ascertained by the disappearance of the murmur with a normal ECG on follow-up by a paediatrician or paediatric cardiologist and by a normal echocardiogram. Whilst the VSD is present, prevention of bacterial endocarditis is attempted by maintaining good dental hygiene. Demonstrates the anatomy of the defect, haemodynamic effects and pulmonary hypertension (due to high flow). The indications for surgical repair depend on the size of the VSD, degree of shunting, and associated lesions. Young infants with large VSDs, refractory heart failure, and large shunts should undergo surgical closure of the defects in infancy. 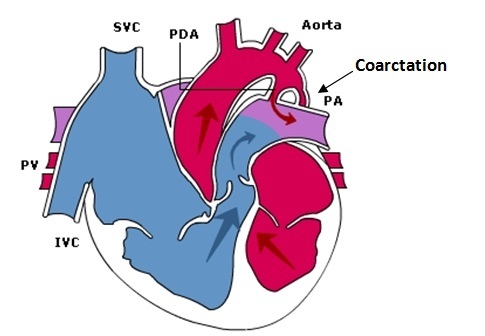 The ductus arteriosus connects the pulmonary artery to the descending aorta. In term infants, it normally closes shortly after birth and is completely closed in most infants by 2 to 3 weeks of age. When there is a failure of ductal constriction after birth, the ductus arteriosus remains patent. The flow of blood across a PDA is then from the aorta to the pulmonary artery (i.e. left to right Fig 3), following the fall in pulmonary vascular resistance after birth. In the preterm infant, the presence of a PDA is not from congenital heart disease but due to prematurity (since muscularization of the medial layer occurs primarily in the third trimester). Diastolic rumble: the murmur continues into diastole because the pressure in the pulmonary artery is lower than that in the aorta throughout the cardiac cycle. In premature infants, a large ductus may only present with a flow murmur, or frequently, with no murmur. The diagnosis is suspected due to the requirement of increasing respiratory support. Surgical closure is the gold standard when indicated in the newborn period. Indomethacin may be considered; it does, however, have the potential to cause necrotizing enterocolitis, intracranial hemorrhage, and renal toxicity. 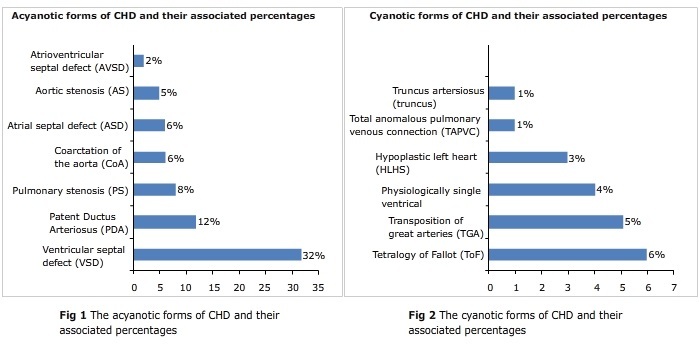 TOF is the most common cause of cyanotic CHD. The most common cause of cyanotic CHD. Comprises up to 10% of all CHD. The pathophysiology relates to shunting of desaturated, systemic venous blood through the VSD to mix with the systemic cardiac output. The greater the degree of obstruction to pulmonary blood flow, the larger the right-to-left shunt and the worse the desaturation. Time of manifestation depends on the severity of right ventricular outflow tract obstruction and thus the amount of pulmonary blood flow; severe obstruction results in cyanosis in the newborn period and presents in the first week of life with cyanosis or collapse. Right ventricular outflow tract obstruction: determines the amount of cyanosis. The direction of shunt depends on the extent of right ventricular outflow tract obstruction. The VSD is almost never restrictive in tetralogy of Fallot. Most are diagnosed antenatally or following the identification of a murmur in the first month or two of life. Sudden hypoxic spells, characterized by tachypnea and hyperpnea, followed by worsening cyanosis. The classical description of severe cyanosis, hypercyanotic spells and squatting on exercise, developing in late infancy. It is important to recognize hypercyanotic spells, as they may lead to cerebrovascular accidents and even death if left untreated. They are characterised by a rapid increase in cyanosis, usually associated with irritability or inconsolable crying because of severe hypoxia, and breathlessness and pallor due to tissue acidosis. With increasing right ventricular outflow tract obstruction, the murmur softens and cyanosis increases. When the severity of obstruction worsens, more blood is shunted across the VSD. Initial management is medical, with definitive surgery at around 6 months of age. It involves closing the VSD and relieving right ventricular outflow tract obstruction, sometimes with an artificial patch, which extends across the pulmonary valve. Infants who are very cyanosed in the neonatal period require a surgically placed shunt to increase pulmonary blood flow. However, the trend now is to offer complete surgical repair when indicated without shunt palliation. Hypercyanotic spells are an indication for early surgery. Do not send a child home from the emergency department (ED) without obtaining a cardiology consultation. The most common cyanotic CHD that presents in the first day of life. The aorta lies anteriorly and arises from the right ventricle; the pulmonary artery is relatively posterior and connected to the left ventricle (ventriculoarterial discordance). Deoxygenated blood is therefore returned to the body and oxygenated blood is returned to the lungs. The pulmonary and systemic circuits are arranged in parallel. Unless there is mixing of blood between them, this condition is incompatible with life. The presentation for infants with TGA depends on the degree of blood mixing. Fortunately, there are a number of naturally occurring associated anomalies, e.g. 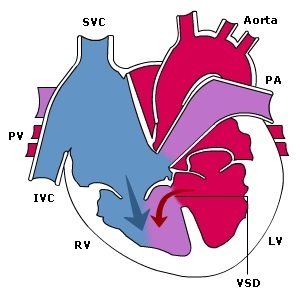 VSD, ASD and PDA. Initial survival depends on the presence of a shunt, allowing mixing between the systemic and pulmonary circulations. These infants present with cyanosis at birth because of right-to-left shunting, and the cyanosis becomes more severe when the ductus arteriosus closes. The lesion is frequently detected antenatally. Cyanosis is the predominant symptom. Presentation is usually on day 2 of life when ductal closure leads to a marked reduction in mixing of the desaturated and saturated blood. Cyanosis may be less severe and presentation is delayed if there is more mixing of blood from associated anomalies, e.g. an ASD. In the sick cyanosed neonate, the key is to improve mixing. The outcome depends on the degree of blood “mixing,” the magnitude of tissue hypoxia, and the ability of the right ventricle to maintain the systemic circulation. Without surgery, most patients die within months. Maintaining the patency of the ductus arteriosus with a prostaglandin infusion is helpful. However, this systemic-to-pulmonary connection tends to close early and thus intervention is required to create a new shunt such as balloon atrial septostomy within the first few days of life. Rare CHD; 2% to 3% of CHD presenting in the neonatal period. It is characterized by anomalous drainage of all pulmonary veins to the systemic circulation. There is embryologic failure of the pulmonary veins to form a connection to the left atrium, and thepulmonary vein carries blood from the lungs to the right atrium. This results in a left-to-right shunt of oxygenated blood back to the lungs rather than to the body. 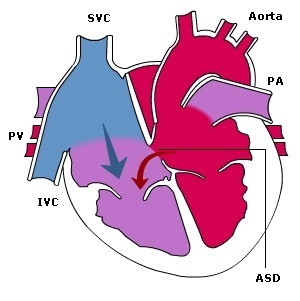 Though pulmonary venous blood does come to the right side, there is complete mixing in the right atrium, and right-to-left shunting across the ASD making this a cyanotic lesion. Presentation: Presents in early infancy; 50% within the first month and almost 90% by one year of age. Obstructive TAPVR present with cyanosis in the first hours to days of life. “snowman” head = Wide mediastinum due to dilated right SVC and a left vertical vein represents the confluence of the pulmonary veins posterior to the left atrium. Surgical correction in which the common pulmonary venous confluence or the individual pulmonary veins are mobilized and anastomosed with the left atrium. If the aorta and pulmonary artery do not divide, the child is born with a persistent truncus arteriosus or common arterial trunk. This is a single (or common) trunk arising from the base of heart and serves as both the aorta and the pulmonary artery. This one big artery has one large valve instead of there being pulmonary and aortic valves. It is almost always associated with a large nonrestrictive VSD, and therefore mixed oxygenated and deoxygenated blood are carried both into the pulmonary and systemic circulation. When pulmonary vascular resistance drops after birth, more blood enters into the low-resistance pulmonary circuit, causing heart failure. Treatment is surgical repair using cardiopulmonary bypass support. Complete repair should be performed within the first weeks to months of life after CHF medical management is optimized. No blood flow from right atrium to right ventricle, therefore a right to left shunt at the atrial level is essential for survival. When tricuspid atresia is associated with severe pulmonic stenosis or pulmonic atresia, it is a duct-dependent lesion. The amount of cyanosis has inverse relationship with the amount of pulmonary blood flow. This involves a severely hypoplastic left ventricle and hypoplasia of the ascending aorta and aortic arch. Therefore, the right ventricle becomes the default pumping chamber for both the lungs and the systemic circulation. The right heart structures (atrium, ventricle, pulmonary arteries) are significantly dilated. This helps the RV to maintain an adequate perfusion pressure in the systemic circulation. This flow is ductus dependent. The newborn is stabilized with prostaglandin to maintain ductal patency. A Norwood operation is performed in the first week of life. This consists of creating a neo-aorta using the native pulmonary valve and augmenting the hypoplastic arch. Pulmonary perfusion is achieved by inserting a modified Blalock-Taussig shunt from the innominate artery or a Sano shunt from the right ventricle. Survivors undergo a Glenn anastomosis (connecting SVC to the branch PA) at 4-6 months of age, and then a Fontan operation (connecting IVC to the branch PA) at 2-4 years of age. At that point, the pulmonary and systemic circulations are separated. The aortic valve leaflets are partly fused together, giving a restrictive exit from the left ventricle. There may be one to three aortic leaflets. Aortic stenosis may not be an isolated lesion. May occur at valvular, supra-valvular or sub-valvular level. In children, regular clinical and echocardiographic assessment is required in order to assess when to intervene. Children with symptoms on exercise or who have a high resting pressure gradient (more than 50 mm Hg) across the aortic valve will undergo balloon valvotomy. Most neonates and children with significant aortic valve stenosis requiring treatment in the first few years of life will eventually require aortic valve replacement. Early treatment is therefore palliative and directed towards delaying this for as long as possible. The pulmonary valve leaflets are partly fused together, giving a restrictive exit from the right ventricle (see figure). 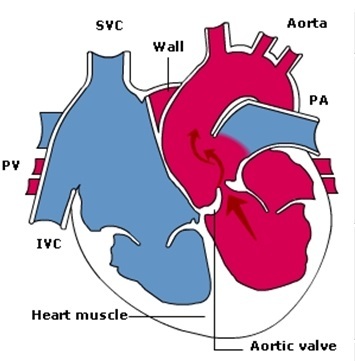 When there is critical or severe valvular pulmonary stenosis, balloon valvuloplasty of the pulmonic valve is performed in the neonatal period. In cases of moderate pulmonary stenosis, the procedure is performed when the gradient across the pulmonary valve exceeds 50 mm Hg. Cases of mild pulmonary stenosis are usually followed conservatively. Coarctation of the aorta is a narrowing of the aorta. The approach to native coarctation varies across centers. Most centers recommend surgical correction of a native coarctation. Others perform balloon angioplasty with or without placement of a stent to relieve coarctation in the adult. 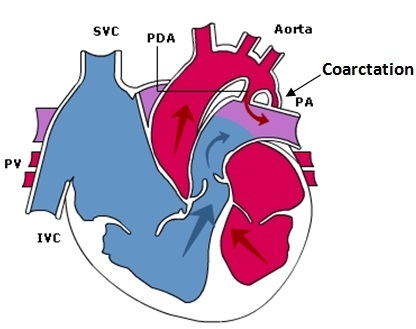 CoA is due to arterial duct tissue encircling the aorta just at the point of insertion of the duct. When the duct closes, the aorta also constricts causing severe obstruction to the left ventricular outflow. These children usually present as ill with heart failure and shock in the neonatal period. Management is to stabilize first (ABC). Prostaglandin E1 should be administered if there is clinical suspicion for a ductal-dependent lesion (dose 0.05- 0.1 mcg/kgper minute; maximum 0.1 mcg/kgper minute). Beware of complications of prostaglandin E1 infusion such as hypotension, tachycardia, and apnea. Protect the airway by intubation and mechanical ventilation before transporting the patient to another medical facility. As a consequence of a large left-to-right shunt for many years, the pulmonary vascular resistance will slowly rise. Eventually, the shunt will reverse and the patient will become cyanosed, typically at about 15-20 years of age (Eisenmenger Syndrome). Patients are usually stable for many years, with typical survival into the 4th or 5th decade of life. However, they may then present with some of the complications of a right-to-left shunt and of pulmonary hypertension. This may be the first presenting feature in a child or young adult with pulmonary hypertension. It should be differentiated from teenagers who present with neurocardiogenic syncope or vasovagal syncope. Clinical examination may reveal cyanosis, a loud P2 and a right ventricular heave. This is often the next insidious symptom of pulmonary hypertension, due to Eisenmenger syndrome. Non-wheezing asthma is the cardinal feature. Again, full history, clinical examination and ECG assist in the detection of such patients. Generally, the first presentation of severe asthma should prompt the physician to obtain an ECG after initial stabilization. This is often a preterminal event in pulmonary hypertension or Eisenmenger Syndrome. It may occur with a chest infection or when there is severe right heart failure. Those with pulmonary hypertension due to any cause are usually advised not to become pregnant. If this does occur, it is lethal in 50% of cases and termination is generally advised. Infants may present to the ED with features of cardiovascular collapse due to non-cardiac causes as well. It is important to remember other causes of cardiorespiratory compromise. In particular, it is often difficult to differentiate CHD from pulmonary disease or sepsis in the newborn. Always include CHD in the differential diagnosis of any critically ill newborn or infant. A patient with CHD may present with collapse and shock, which is defined as an acute state where the circulation is inadequate to meet the metabolic demands of tissues. However, other cardiac conditions (e.g. cardiomyopathies, arrhythmias, pericardial effusion, etc.) may also present in a shocked state. There are also many non-cardiac causes of shock (e.g. sepsis, anaphylaxis, inborn errors of metabolism) which must be considered in the differential diagnosis of shock and metabolic acidosis. Collapse and/or shock due to structural heart disease is usually associated with left-sided obstructive lesions that result in inadequate systemic blood flow (e.g. aortic stenosis, coarctation of aorta). General principles of resuscitation are essential; airway, breathing then circulation. Maintain adequate inspired oxygenation, regardless of the cause. There is often a concern that oxygen administration may be dangerous, (e.g. might close a life-sustaining ductus). In general resuscitation, this is highly unlikely and standard resuscitation interventions should be used first. Once the cause of collapse is known, this may then be modified. Strongly consider commencing a prostaglandin infusion even before a diagnosis has been made. 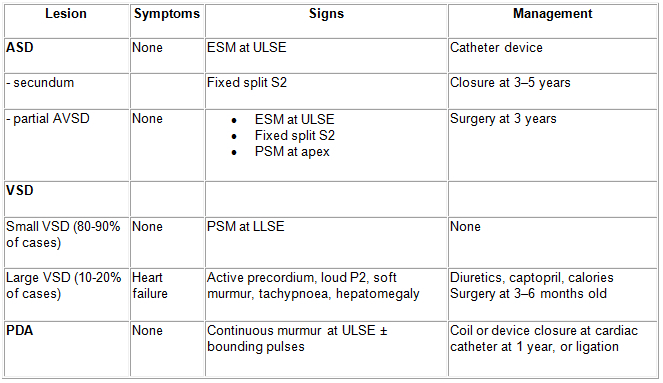 The table below outlines the management you should always consider when a sick collapsed baby presents to the ED. 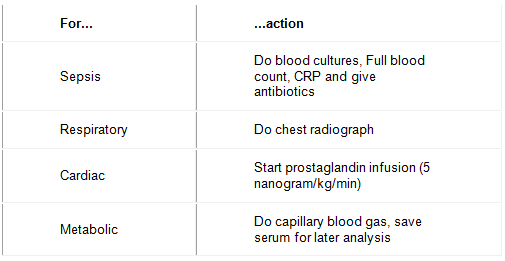 Do not forget non-cardiac causes of shock in a patient with CHD, especially sepsis. Tachypnoea is an early feature of heart failure in children. Children do not present in heart failure with left to right shunt due to CHD after 1 year, since they have developed pulmonary vascular disease by this time. The thickening of the pulmonary artery walls in response to the left-to-right shunt will limit the pulmonary blood flow and the signs of heart failure. The principles of managing heart failure after the first week of life are to reduce preload with diuretics and reduce afterload with ACE inhibitors (use of ACEi somewhat controversial) whilst maintaining optimal nutritional intake. During the first year of life, the pulmonary vascular resistance continues to rise, such that the features of cardiac failure gradually resolve. Patients will be developing pulmonary hypertension and pulmonary vascular disease. Prostaglandin is likely to be beneficial for infants with heart failure in the first week of life; pre-load and after-load reduction with diuretics and ACE Inhibitors are used for heart failure presenting beyond 1 week, once outflow tract obstruction is excluded. Cyanosis is the clinical description of the bluish discolouration of the skin and mucous membranes that corresponds to greater than 5 g/dl of deoxygenated haemoglobin in the blood. Mild degrees may not be observed and a saturation monitor should be used to confirm normality. Look for central cyanosis in the tongue and mucous membranes. Cyanosis (oxygen saturation less than 94%) may be due to cardiac disease, respiratory disease, metabolic disease or sepsis. Be mindful of where the saturation probe is positioned. It should be in the right hand to pick up cyanotic heart disease (pre-ductal saturation). If only the feet are blue (post-ductal saturation), then it could be due to right to left shunt at the duct in coarctation of the aorta. Cyanosis with little or no respiratory distress and lack of radiographic evidence of lung disease suggests underlying congenital heart disease. A hyperoxia test is useful in distinguishing between cardiac and pulmonary causes of desaturation. With the infant inhaling 100% FiO2, the arterial PaO2does not increase significantly if the cause is cardiac. In a neonate (under 4 weeks), it is always worth considering the use of a prostaglandin infusion. Oxygen is not helpful in the treatment of cyanotic CHD: indeed, one of the ways to make the diagnosis is to show that there is little improvement in saturations when oxygen is administered. Then an echocardiogram should be performed. Surgical procedure performed based on the lesion. Many patients with CHD present with non-specific symptoms and signs, such as breathlessness and failure to thrive. In such situations, the diagnosis may be delayed. Paediatric Heart Disease: a Clinical Guide. Piers Daubeney, Michael Rigby, Michael Gatzoulis, Koichiro Niwa. BMJ Books 2012. 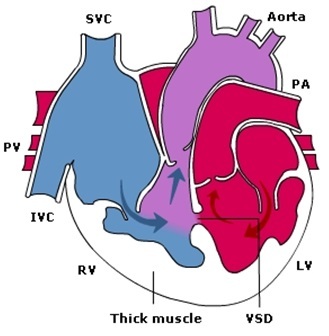 Congenital Diseases of the Heart: Clinical-Physiological Considerations. Abraham Rudoplh. Wiley-Blackwell Publications. 2009. 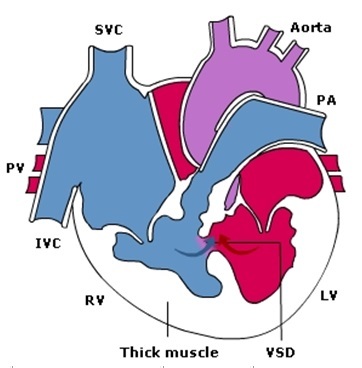 Interesting eLearning Module on Congenital Heart Disease (CHD). I was surprised to learn that this affects 8 per 1000 live births and accounts for 10% of all congenital anomalies. was unaware this is still the commonest cause of death in the first year of life. Children with CHD may present at any time from birth to adult life. However one-third of children will have severe defects and become symptomatic in infancy.